That's very cool. Are the design elements of your own inspiration, or did you use an original as a base? I love the aesthetic of it, well done. Really, really cool! I have a soft spot in my heart for kriegsmessers and this one is great! Was it inspired by any originals or is it all yours? It is purely fantasy,i dont know of any existing like this. I loved the blade on the, Orcrist sword, in the Hobbit movie,And thought a cleaver/falcata type blade would be cool on a messer.And i wanted a wing-ish motif overall,(he did a great job on that). A really beautiful sword. Really like the design you came up with. It wound up being just awesome! I bet it's a beast too! The shorter blade with the 2 handed grip has got to be wicked! very nice, it has that authentic could be of the period feel, with a blaze of fantasy inspiration. the blade itself is very unique. 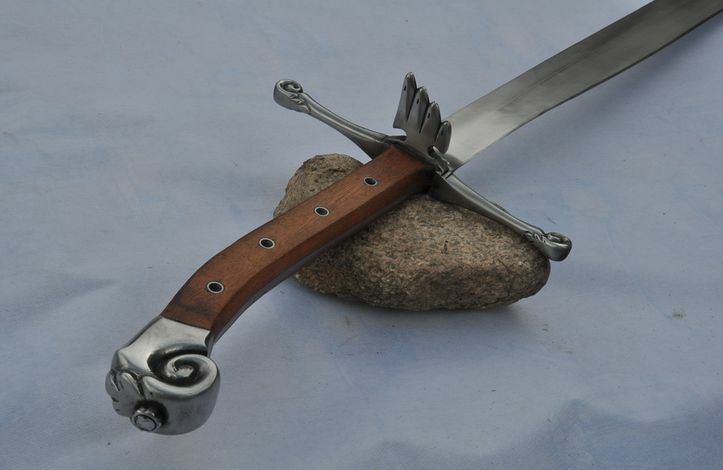 Aesthetically very pleasant design, it also looks practical as a real using sword. Sort of could be what one would imagine as a weapon in Game of Thrones or any other very good fantasy novel. Really great art piece and sound weapon design. 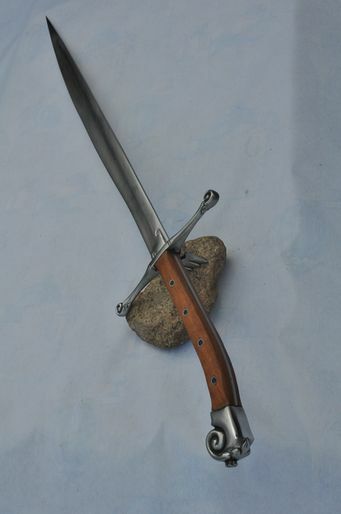 I've always liked that kriegmessers use a full-tang design, it just seems so much more sturdy to me than the traditional hidden tang on most swords. But I've never seen a Kriegmesser who's aesthetics I really liked until now. Job very well done to the smith, and congratulations to you on a gorgeous sword. Any chance we could see a photo straight on from the side? With the sword at an angle in both of your shots it's hard to get an accurate idea of the blade length compared to the hilt. ... purely fantasy ,i dont know of any existing like this. Fantasy, but without being cartoonish. It's not difficult to imagine a real historical example. Damn fine piece. Thanks for showing us. I agree, that's what I like so much about it. I don't care for fantasy weapons that don't look functional. This one looks just as useful and affective as the historical examples I've seen. Thanks Karl, for some reason when I opened the thread it only showed the first two pictures, now I see the third and fourth. Damn I want that, looks great man! A computer once beat me at chess, but it was no match for me at sword fighting. Pleasing to the eye and I always admire people that can see something that does not exist that well. I rarely can...at least not artistically...and at least not in a way that makes me happy with the end result. I hope its as neat in the hand as it is in the picture!